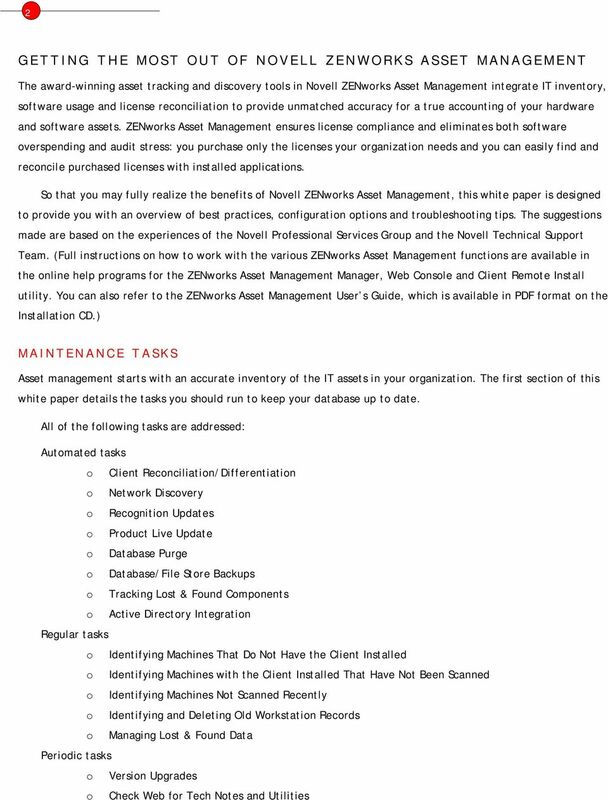 Download "Novell ZENworks Asset Management"
4 4 Periodic check for updates. You can configure ZENworks Asset Management to check the Novell Web site periodically and alert you if updates are available. The alert will appear in the status bar of the ZENworks Asset Management Manager. You can then install the updates via either of two methods: o o Manual download and update. You can download the updates from the Novell Web site and install them yourself. One-step update and install. You can have ZENworks Asset Management download all available updates and install them automatically. Automated update schedule. You can also schedule ZENworks Asset Management to check the Novell Web site periodically, downloading and installing any available updates automatically. Note: Alternatively, you can use an RSS feed to be notified of changes to the ZENworks Asset Management Updates page at More information about RSS is available on this page. In most cases, updates can be applied in a few minutes. The actual time required for the distribution of updates to ZENworks Asset Management applications depends on the available network resources. Stopping and restarting the inventory process may consume additional time. Note: You should back up your database and file store prior to applying any updates. See Database / File Store Backups below. Database Purge It is important to schedule a regular database purge to remove deleted information from the database. To schedule a database purge, follow these steps: Step 1. Configure how long data is to be kept in the database. (From the ZENworks Asset Management Manager, select Enterprise Options from the Tools menu.) Step 2. Schedule one or more purge tasks. (Select Database Purge from the Administration menu.) Hint: Include the scheduled time and a brief description in the name of the task, so that you can easily identify it in the list of scheduled tasks displayed on the Tasks tab of the Process Control Panel. Database / File Store Backups Database servers should be backed up on a regular basis. ZENworks Asset Management conforms to your normal backup schedule. Whenever you back up your database servers, you must back up the file store directory as well. If you ever need to restore your database, you will need to restore the corresponding file store. Tracking Lost & Found Components Lost & Found components have an asset tag or a serial number that was associated with a workstation in a previous inventory, but is no longer associated with that workstation or any other in the database. If you choose to track components using the Lost & Found workstation, it is important that you view the list of components and clear the data on a regular basis. See Managing Lost & Found Data on page 6. To change Lost & Found tracking, select Enterprise Options from the Tools menu in the ZENworks Asset Management Manager. 5 5 5 Note: Upgrades to 3.1+ will leave Lost & Found tracking enabled. For new installations of 3.1+, Lost & Found tracking is disabled by default. Active Directory Integration (optional) If you have demographic data in an Active Directory source, you can configure a scheduled task to update specific ZENworks Asset Management fields with this data. 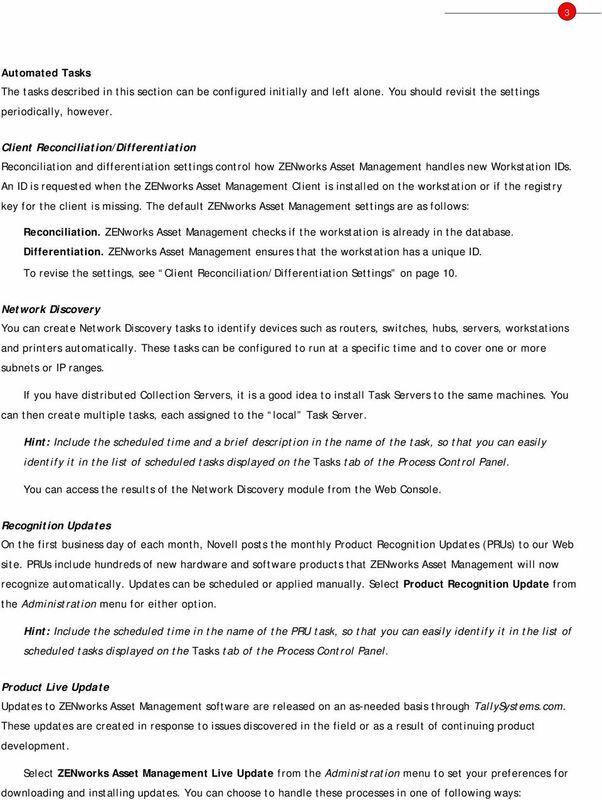 Active Directory tasks are configured from the Management tab of the ZENworks Asset Management Manager. Hint: Include the scheduled time and a brief description in the name of the task, so that you can easily identify it in the list of scheduled tasks displayed on the Tasks tab of the Process Control Panel. 6 6 Regular Tasks The following tasks are suggested for maintaining database integrity. 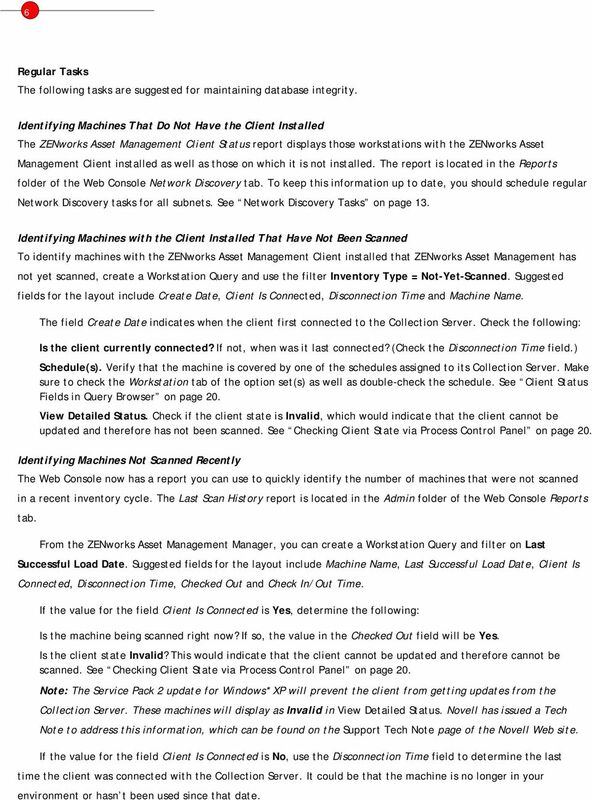 Identifying Machines That Do Not Have the Client Installed The ZENworks Asset Management Client Status report displays those workstations with the ZENworks Asset Management Client installed as well as those on which it is not installed. The report is located in the Reports folder of the Web Console Network Discovery tab. To keep this information up to date, you should schedule regular Network Discovery tasks for all subnets. See Network Discovery Tasks on page 13. Identifying Machines with the Client Installed That Have Not Been Scanned To identify machines with the ZENworks Asset Management Client installed that ZENworks Asset Management has not yet scanned, create a Workstation Query and use the filter Inventory Type = Not-Yet-Scanned. Suggested fields for the layout include Create Date, Client Is Connected, Disconnection Time and Machine Name. The field Create Date indicates when the client first connected to the Collection Server. Check the following: Is the client currently connected? If not, when was it last connected? (Check the Disconnection Time field.) Schedule(s). Verify that the machine is covered by one of the schedules assigned to its Collection Server. Make sure to check the Workstation tab of the option set(s) as well as double-check the schedule. See Client Status Fields in Query Browser on page 20. View Detailed Status. Check if the client state is Invalid, which would indicate that the client cannot be updated and therefore has not been scanned. See Checking Client State via Process Control Panel on page 20. Identifying Machines Not Scanned Recently The Web Console now has a report you can use to quickly identify the number of machines that were not scanned in a recent inventory cycle. The Last Scan History report is located in the Admin folder of the Web Console Reports tab. 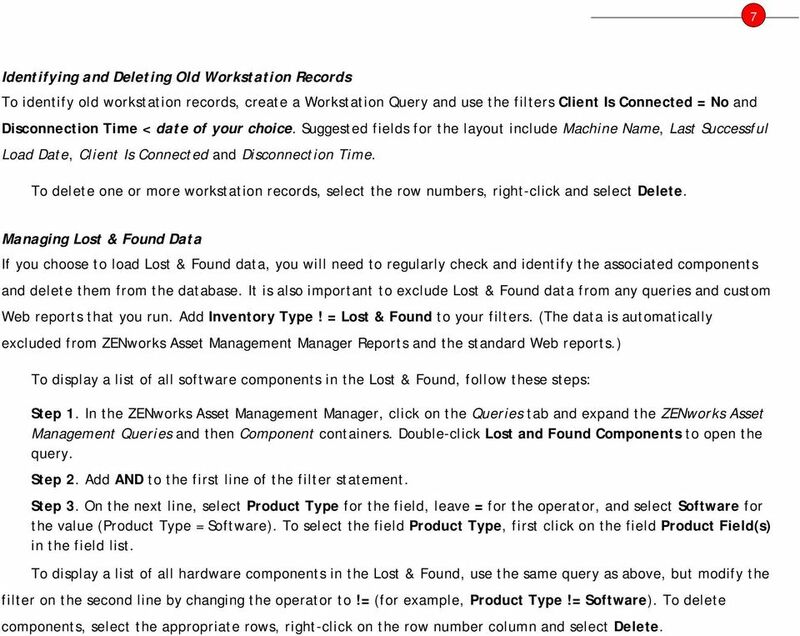 From the ZENworks Asset Management Manager, you can create a Workstation Query and filter on Last Successful Load Date. Suggested fields for the layout include Machine Name, Last Successful Load Date, Client Is Connected, Disconnection Time, Checked Out and Check In/Out Time. If the value for the field Client Is Connected is Yes, determine the following: Is the machine being scanned right now? If so, the value in the Checked Out field will be Yes. Is the client state Invalid? This would indicate that the client cannot be updated and therefore cannot be scanned. See Checking Client State via Process Control Panel on page 20. Note: The Service Pack 2 update for Windows* XP will prevent the client from getting updates from the Collection Server. These machines will display as Invalid in View Detailed Status. 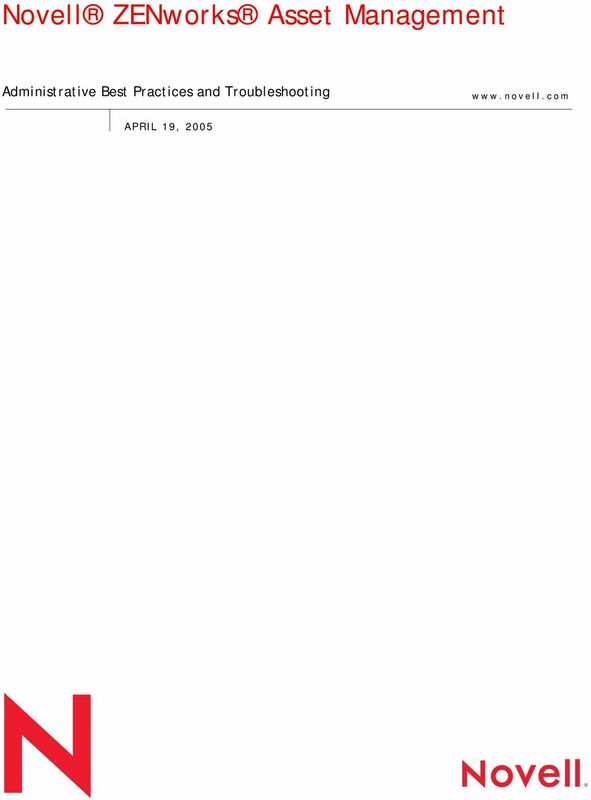 Novell has issued a Tech Note to address this information, which can be found on the Support Tech Note page of the Novell Web site. If the value for the field Client Is Connected is No, use the Disconnection Time field to determine the last time the client was connected with the Collection Server. It could be that the machine is no longer in your environment or hasn t been used since that date. 7 7 7 Identifying and Deleting Old Workstation Records To identify old workstation records, create a Workstation Query and use the filters Client Is Connected = No and Disconnection Time < date of your choice. Suggested fields for the layout include Machine Name, Last Successful Load Date, Client Is Connected and Disconnection Time. To delete one or more workstation records, select the row numbers, right-click and select Delete. Managing Lost & Found Data If you choose to load Lost & Found data, you will need to regularly check and identify the associated components and delete them from the database. It is also important to exclude Lost & Found data from any queries and custom Web reports that you run. Add Inventory Type! = Lost & Found to your filters. (The data is automatically excluded from ZENworks Asset Management Manager Reports and the standard Web reports.) To display a list of all software components in the Lost & Found, follow these steps: Step 1. In the ZENworks Asset Management Manager, click on the Queries tab and expand the ZENworks Asset Management Queries and then Component containers. Double-click Lost and Found Components to open the query. Step 2. Add AND to the first line of the filter statement. Step 3. On the next line, select Product Type for the field, leave = for the operator, and select Software for the value (Product Type = Software). To select the field Product Type, first click on the field Product Field(s) in the field list. To display a list of all hardware components in the Lost & Found, use the same query as above, but modify the filter on the second line by changing the operator to!= (for example, Product Type!= Software). To delete components, select the appropriate rows, right-click on the row number column and select Delete. 8 8 Periodic Tasks In order for ZENworks Asset Management to track your hardware and software assets accurately, you must periodically update the product and download new and relevant information from the Novell Web site. Upgrading Novell ZENworks Asset Management Version updates to the product are released once or twice a year on average. These upgrades generally include new features as well as improvements to the existing functionality of ZENworks Asset Management. Version updates will be shipped to you automatically if you have a current maintenance contract with Novell. 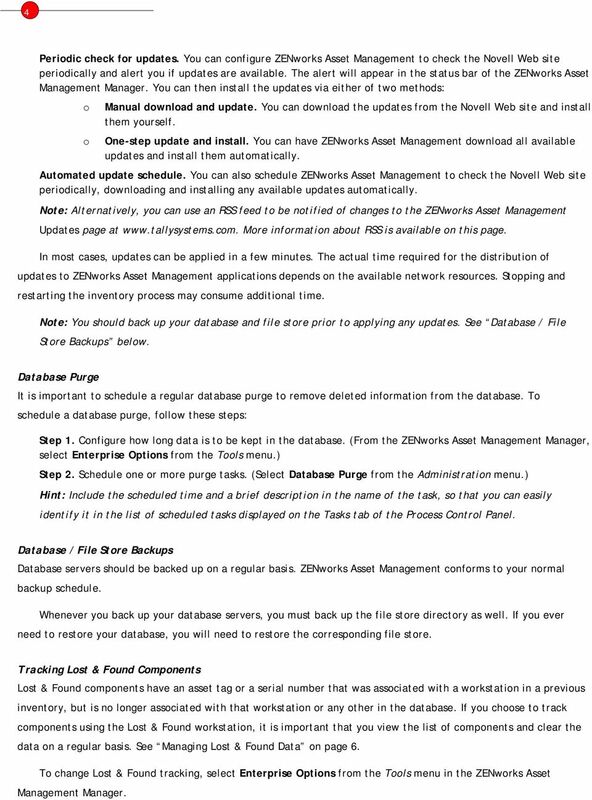 Please keep the following in mind: It is vital that you back up your ZENworks Asset Management database and the file store prior to applying an upgrade. Once the upgrade process has started, DO NOT interrupt the process. There is no backup process for the upgrade path. If you do interrupt the process, you will need to restore the database and file store and then reapply the upgrade. If the process does not continue after you are asked about stopping all ZENworks Asset Management services, do not cancel the upgrade. Please contact Technical Support at that point. (If you do cancel the upgrade, the database accounts will be locked. This is easily remedied: Technical Support has a utility to unlock the database so that you can continue with the upgrade process.) Version upgrades are applied via CD from a location that is central to your ZENworks Asset Management installation: usually from the workstation or server at which the original installation was performed. These automated update processes will update the ZENworks Asset Management database and file store, which will in turn trigger updates to ZENworks Asset Management applications (Collection Servers, Task Servers, and Manager) and the client applications. These updates are pushed out automatically without the need to visit any systems in the field. In most cases, version updates can be applied in an hour or less. The actual distribution time depends on the available network resources. 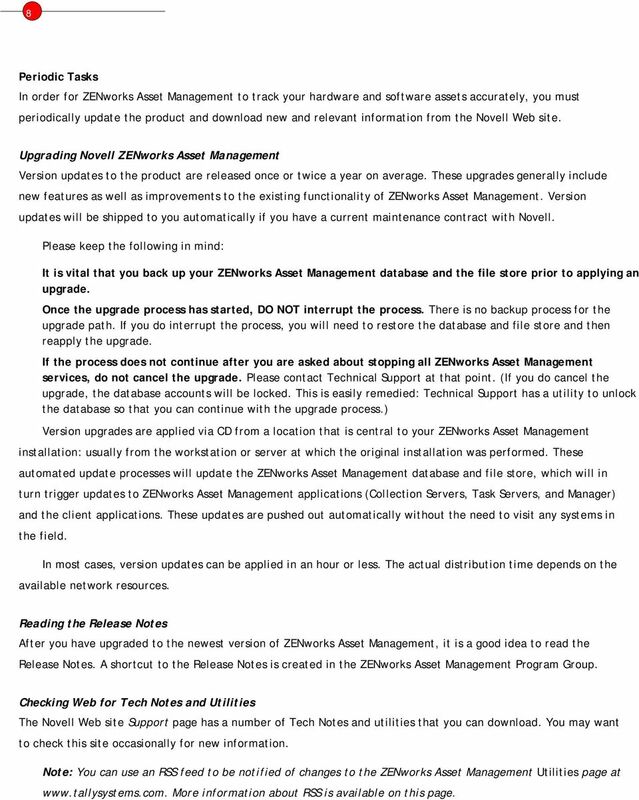 Reading the Release Notes After you have upgraded to the newest version of ZENworks Asset Management, it is a good idea to read the Release Notes. A shortcut to the Release Notes is created in the ZENworks Asset Management Program Group. Checking Web for Tech Notes and Utilities The Novell Web site Support page has a number of Tech Notes and utilities that you can download. You may want to check this site occasionally for new information. Note: You can use an RSS feed to be notified of changes to the ZENworks Asset Management Utilities page at More information about RSS is available on this page. 9 9 9 ADDITIONAL FEATURES Additional information about scanning workstations is provided here. Running Inventory from the Command Line The utilities ScanNow and ScanNowE have been replaced by the option to run the inventory using a command line argument. Scan Now. 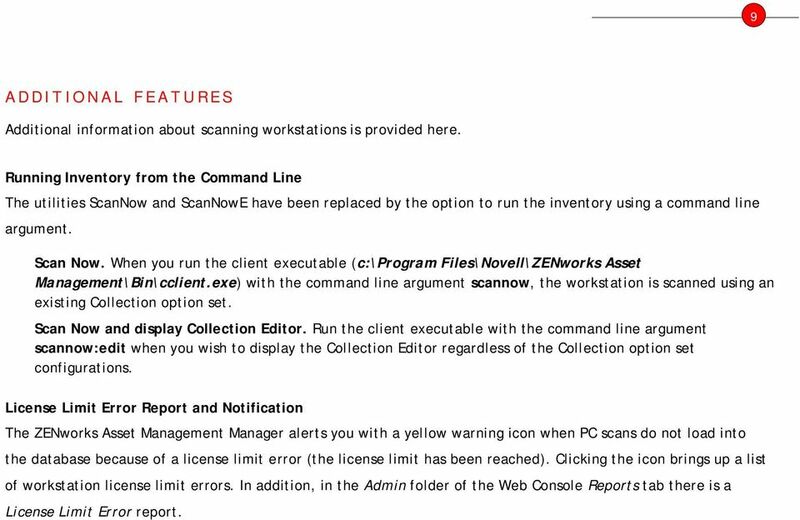 When you run the client executable (c:\program Files\Novell\ZENworks Asset Management\Bin\cclient.exe) with the command line argument scannow, the workstation is scanned using an existing Collection option set. Scan Now and display Collection Editor. Run the client executable with the command line argument scannow:edit when you wish to display the Collection Editor regardless of the Collection option set configurations. License Limit Error Report and Notification The ZENworks Asset Management Manager alerts you with a yellow warning icon when PC scans do not load into the database because of a license limit error (the license limit has been reached). Clicking the icon brings up a list of workstation license limit errors. In addition, in the Admin folder of the Web Console Reports tab there is a License Limit Error report. Understanding Task Scheduler FIGURE 33.14. Task Scheduler. The error reporting screen. Version 4.61 or Later. Copyright 2013 Interactive Financial Solutions, Inc. All Rights Reserved. ProviderPro Network Administration Guide. Legal Notes. Regarding Trademarks. 2013 KYOCERA Document Solutions Inc.
Introduction. This white paper provides technical information on how to approach these steps with Symantec Antivirus Corporate edition.